I have an extensive model car "boneyard" of old built kits which I rescued from various garage sales back in the '80's. Some of these are slated for restoration and others have been picked over for parts. A few others have been set aside for doing something a little more creative with. The parts of my MPC 1976 Pontiac Ventura had been rattling around in a dusty box for the last 20 years or so and I felt it was finally time for my Pontiac to get it's due. My goal for the Ventura was to make a modern interpretation of a GTO Judge with elements of hot rodding trends from the past four decades. Muscle car style from the '60's, a body from the '70's, rodding tricks from the '80's, '90's, & '00's and a stance straight from today. The project began by disassembling the previously built Ventura and soaking it's parts in a vat of Castrol Super Clean for several days. My Pontiac had been poorly painted with some thick metallic red paint and the body did not want to strip very easily. Eventually, though it came clean with the aid of some serious scrubbing. At that time I also noticed the roof had some minor heat distortion from some over zealous gluing of the window parts by it's first builder. Tube glue use to be a lot stronger back in the day and too much of it would cause the parts to actually start melting where glued. Fixing this required bondo-ing the roof and then block sanding it smooth again. Since this was going to be a custom I also shaved the door handles, corner lights and removed all the molded-in emblems. Next, I scratch-built a front air dam from sheet styrene. The original 1969 Pontiac GTO Judge had a large rear wing on the trunk. I tried various wings including an original '69 wing, but they all looked too big and round on the square-ish Ventura body. I decided to make a smaller version of a Judge style wing by using the small rear spoiler from an AMT '701/2 Z-28 kit and then carving away the back edge until I had the wing shape I wanted. The Pontiac Trans-Am style "shaker" hood scoop was part of the original MPC Ventura kit and I thought it fit my theme for the car perfectly so I re-used those pieces. I also notched the rear bumper along it's bottom edge and made the center twin exhaust tips from aluminum tubing designed for airplane wing struts. 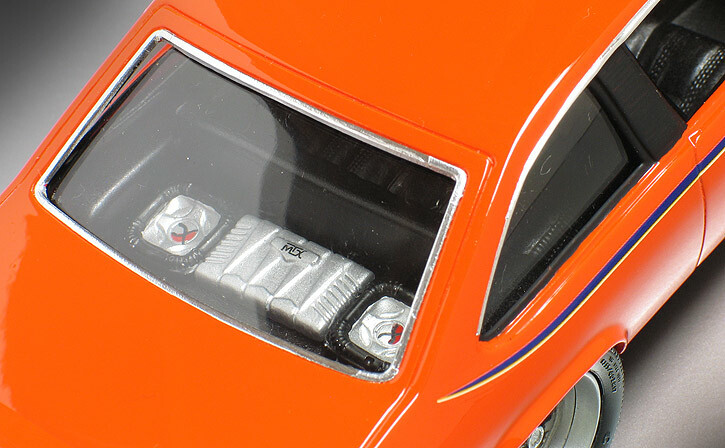 Lastly, the '80's style side mirrors came from an '89 Tamiya Toyota Supra kit and required just a little trimming to fit the Ventura's B-pillars. 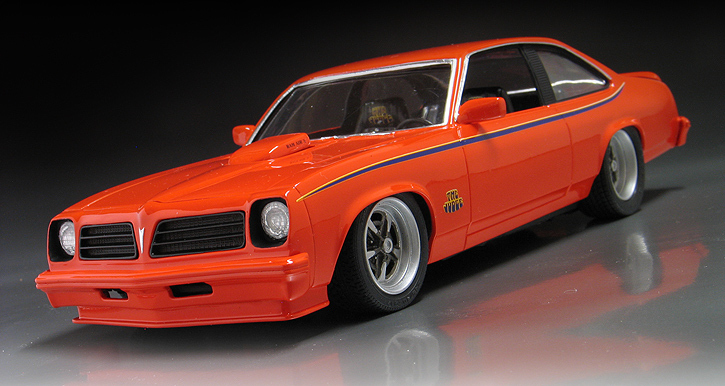 I wanted to replicate the '69 Judge paint scheme so I sprayed the body with Testor's "Hugger Orange" lacquer paint. That's a Chevy color but it is a close match for a '69 Pontiac color called "Carousel Red." 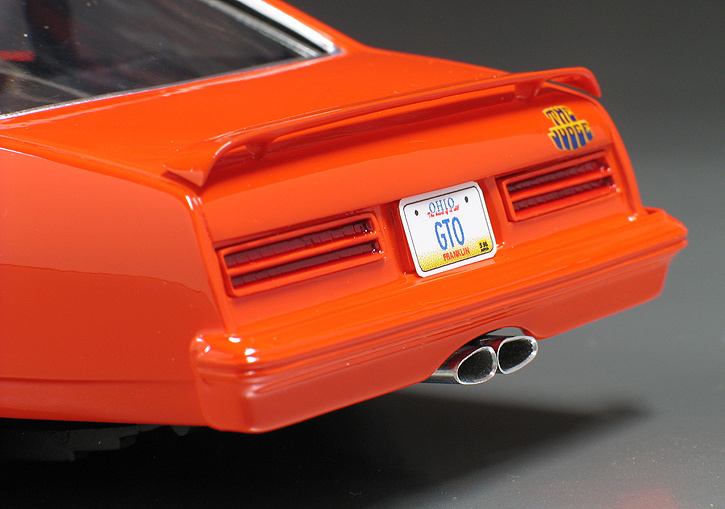 The Judge decals came from the Model King re-issue of the '69 GTO funny car kit. The side stripe decals if used as is would not have been long enough to fit the contours of the Ventura, so I used a second set of decals from a second kit to cut and splice together a longer stripe for each side. The '69 Judge was one of the first factory cars to feature a body colored bumper. It was also a popular hot rodding trend in the '80's to paint the bumpers and black out the trim. Although it's not done very much anymore, I thought a "painted bumpers look" would fit this car well and help visually blend those big '70's safety bumpers into the body. The last step for paint was to cover everything in a coat of PPG urethane clear. I wanted my Ventura to have a set of old style muscle car wheels, but in a modern size. 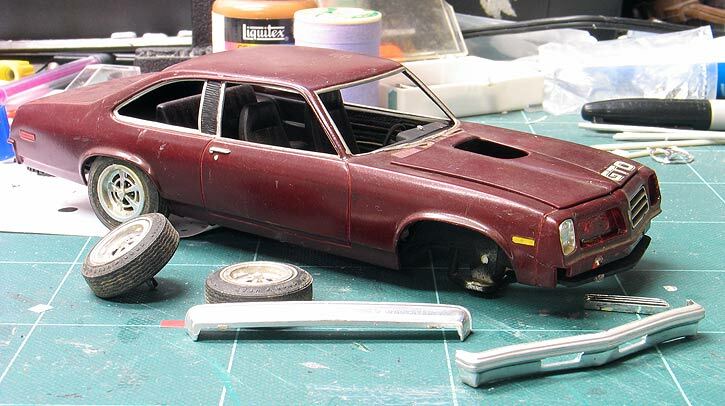 To make the large diameter Pontiac Rally II wheels I started with a set of wheels from the Revell '69 Judge kit. 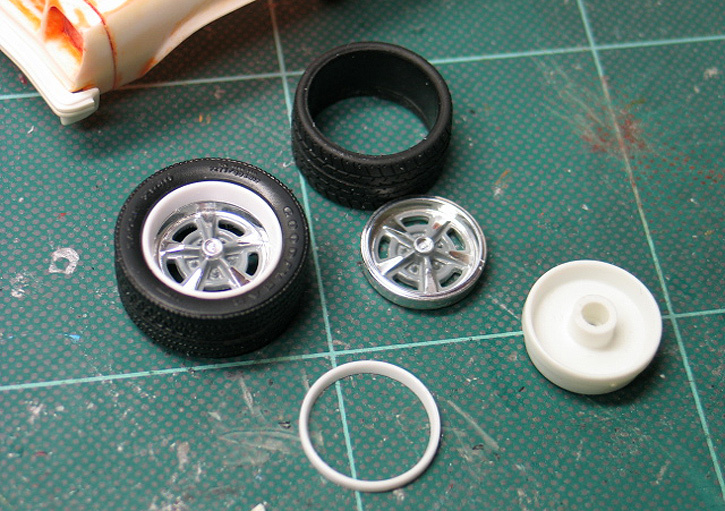 The Revell wheels are in 1/24th scale and measure out to about 17" in 1/25th scale. This was a start but I wanted them bigger and wider, so I cut the rims off the 18" wheel backs from an AMT 2009 Challenger kit in two different widths. These were then mated to the front of the Revell wheels to end up with a one off set of wide and wider 18" Rally IIs. The big rear tires came from a Revell C5 Corvette kit and the smaller front tires came from a Fujimi optional wheel and tire kit. 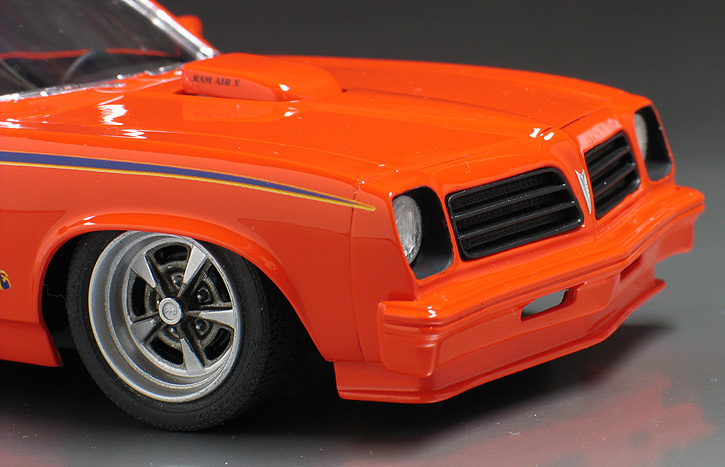 This model is a simple curbside build, so interior, engine and chassis details were kept simple. The only modification I added to the interior other than simple detail painting was to add a set of subwoofers and an amp which I cast copies of from a Jada Toys diecast car. The chassis and suspension was also severely hacked so I could get the car to sit "down in the weeds." It felt good to finally rescue this old '70's cruiser from out of my "styrene boneyard" and get it back on the display shelf where it belongs.